SA International (SAi), the leading provider of solutions for the professional signmaking, wide-format digital printing and CAD/CAM for CNC machining industries, has announced a worldwide agreement for the supply of SAi FlexiSTARTER cutting software with the full range of Mutoh ValueCut cutters. The version of the software configured for use with the Mutoh cutters is known as the SAi FlexiSTARTER ValueCut edition. Currently, there are three cutters in the ValueCut range: the ValueCut 600, ValueCut 1300 and ValueCut 1800, which deliver cutting widths of 610mm (24”), 1320mm (52”) and 1830mm (72”), respectively. SAi FlexiSTARTER ValueCut software includes the drivers and registration marks for the Mutoh ValueCut cutter as well as a wide range of features for designing, drawing, viewing, manipulation, and tools for plotting and cutting. The software also provides a user-friendly interface for creating cut-vinyl signage and contour cut decals of various substrates for special applications. 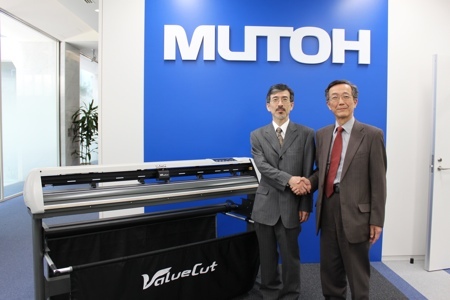 Pictured: Masa Shirasaka, SAi Sales and Technical Support Manager, Japan (left) with Yuji Yata, Director and General Manager, International Business Division at Mutoh.